Quote of the day:God, our Creator, has stored within our minds and personalities, great potential strength and ability. Prayer helps us tap and develop these powers. A nice crunchy gluten free snack and my husbands favorite, these chips are not as addictive as the potato chips but certainly are tastier, healthier and increasingly gaining popularity. While growing up we were not familiar with the store bought snacks and Amma made her snacks at home. Most often I prefer making them at home since the fresh homemade are tastier and free of artificial flavors and preservatives. A simple recipe but definitely worth the try. To read about Maravallikizhangu/Tapioca click here. Peel the dark outer skin of tapioca and set aside. Heat enough oil in a kadai/ pan, using a metal strainer immerse few curry leaves and drop in the oil and set aside when fried. Using a vegetable slicer/Mandolin slicer slice the tapioca into round discs directly into the oil. ( be very very careful while doing this). If you are not very confident then slice them on to a cutting board and deep fry them in batches. When done ( bubbles will subside in the oil ). Drain on a kitchen/paper towel, sprinkle chilli powder and salt while still hot and toss a little bit and transfer to an airtight container. Finally add the fried curry leaves ( crumble few ) and mix well. 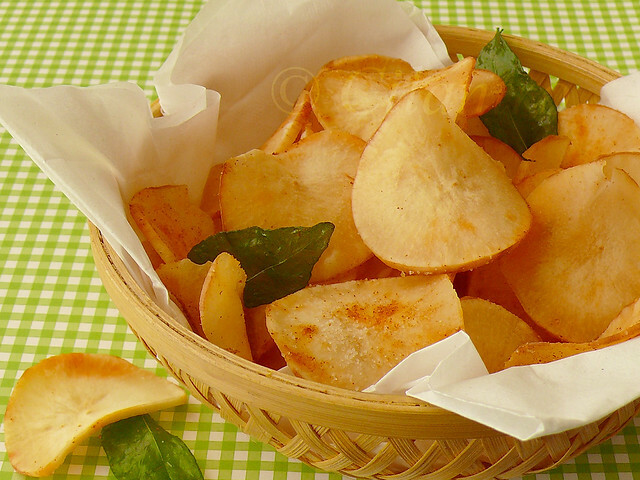 TIPS:The chips can be sliced into thin strips (thinner than french fries) but I prefer the round slices. A pinch of asafoetida or amchur powder can be added but I prefer to keep it simple. Lovely ones.. I too like the chips shaped ones than the fries shaped.. I do quite often,can finish that whole bowl rite now,soo crispy and yummy..
you are welcome in my space.. So simple but yet so delicious. Would love to try to make it at home. They look super crunchy, very new for me. super crunchy chips..love the pictures!!! Lovely click....these chips are my fav. I like the thin long ones (kucchi chips a called here). looks so crisp n yumm....thx u for ur lovely comment....u have a nice blog,keep it up!! 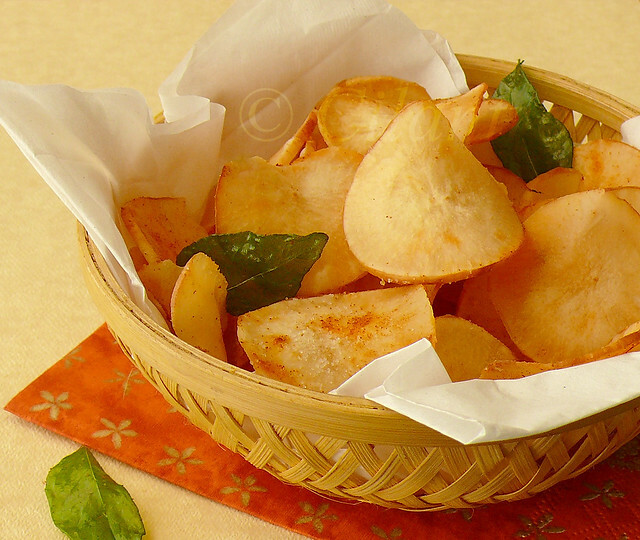 Nice clicks and these chips are my favorite,looks so crispy and crunchy.